(+$300 a year maintenance fee). If you are in a multi-doctor practice, please call to ask about our volume discount. Contact Michael Silbert D.C. directly at (312) 212-1602. Dr. Silbert is available Mon-Fri 9am-5pm Cst. You can also fill out our Online Purchase Request Form. *There is no purchase obligation by filing out this form. 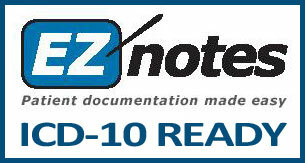 After Purchase, all EZNotes Inc. Software comes with a 30 Day Risk Free Trial. @Copyright 2002-2018- eznotesinc.com | EZ Notes Inc.